Parents! Be sure to get your children’s permission before having fun in the kitchen! • 1 box cheap cake mix. • Eggs and other ingredients to make the cake mix. Read the box for details. • Cupcake liners – the metallic or pastel disposable “cups” you use to bake cupcakes in. • Cookies for “dirt” – Chocolate wafers, oreos, or burnt homemade cookies. • Gummi worms and/or other decorations. Mix the cake mix according to the instructions on the box. Stick the cupcake liners on a cookie sheet or inside muffin cups. Fill each liner about 3/4 full of cake batter. Bake according to the directions on the cake mix box. For cake mix cookies, check out here. Smash your cookies into small pieces – it’s your choice as to how fine the bits are and whether they’re all roughly the same size. You get the idea. Smash ’em up. If you need stress relief, visualize bosses and coworkers you haven’t gotten along with while you do it. 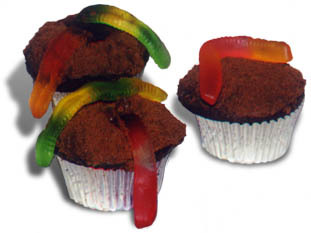 Sprinkle the smashed cookies on top of the cupcakes to simulate dirt and adorn with the flaccid gummi worms. Wow – isn’t that tasty looking? What other decorations can you come up with?